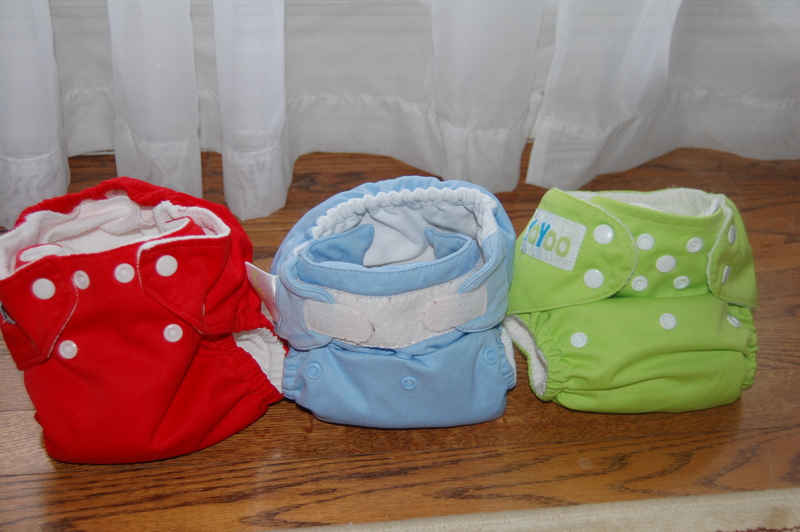 There are so many different brand of cloth diapers out there now, it is hard to keep up. It seems I hear of a new brand of diapers every other week lately. A couple months ago I came across Snaps and Snails YoYoo bamboo pocket diapers. YoYoo pocket diapers are mom-invented, which I love! I purchased 2 of these diapers and they arrived promptly. The colors are very bright and vivid, the bamboo was very soft. They were easy enough to prep – wash and then rinse several times. I had never used bamboo diapers and I am happy to report they performed as well as my BumGenius and FuzziBunz diapers. Yo-Yoo one size pocket diapers are a beautiful product. Each diaper is made up of certified organic bamboo. The bamboo micro-fiber is soft and luxurious, as well as hypoallergenic, keeping your baby comfy and happy. The outer layer of the diaper is made of polyurethane laminate, which is waterproof and durable, extending the life of the diaper while keeping your babies clothes dry. 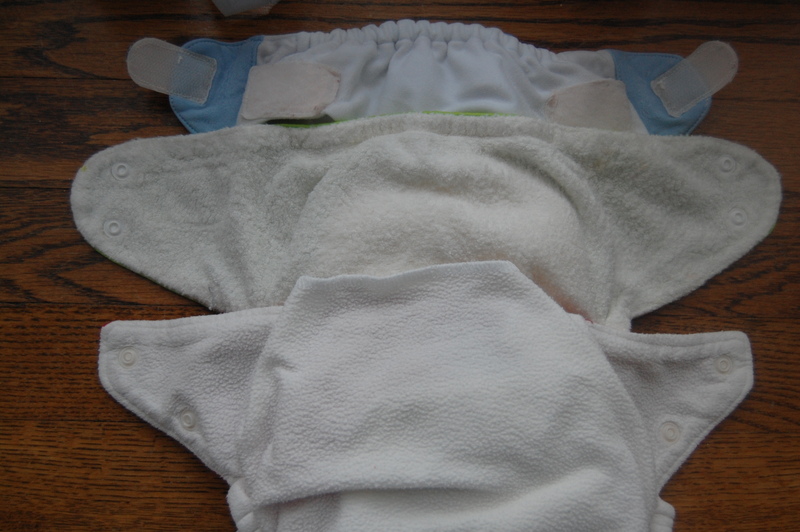 Each diaper comes with a 4-layer, plush and absorbent bamboo fleece insert which snaps into the diaper, holding it in place. 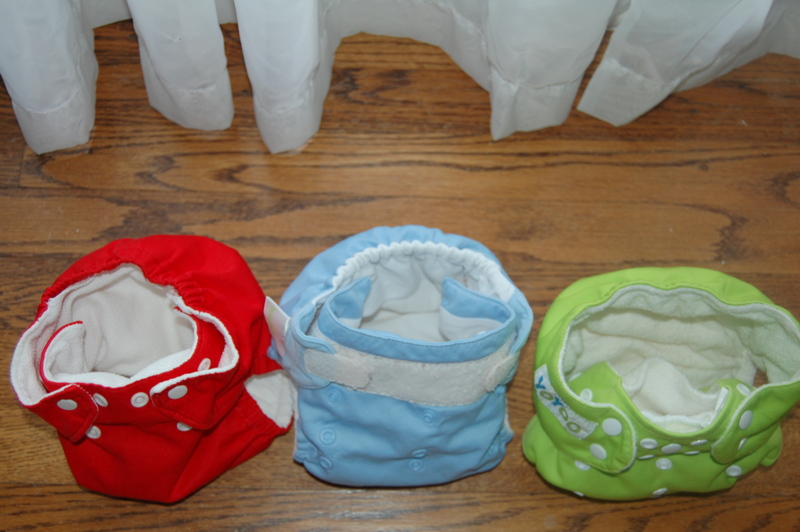 They are made with snap closures to allow for easy adjustment and a snug fit as your baby grows and develops. These one size diapers are easily adjusted to fit any baby from 5lbs – 35lbs and are available in 5 bright and playful colors. My son is 22 months, so snaps are a must. The Velcro on my BumGenius (BG) diapers leaves too much freedom for a little boy to riiipppp off the diaper and hose down my house – so no Velcro unless he’s also wearing pants (two can play at this game). 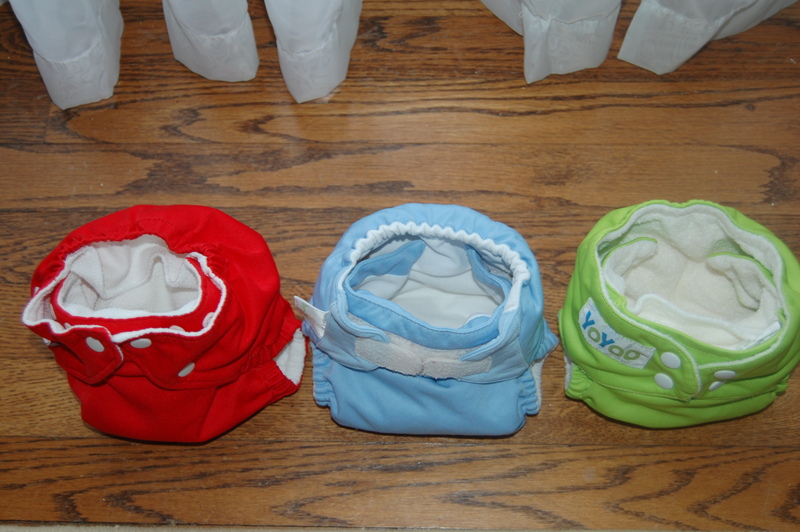 The Velcro also tends to come loose in the wash and create a long line of BG diapers – frustrating. 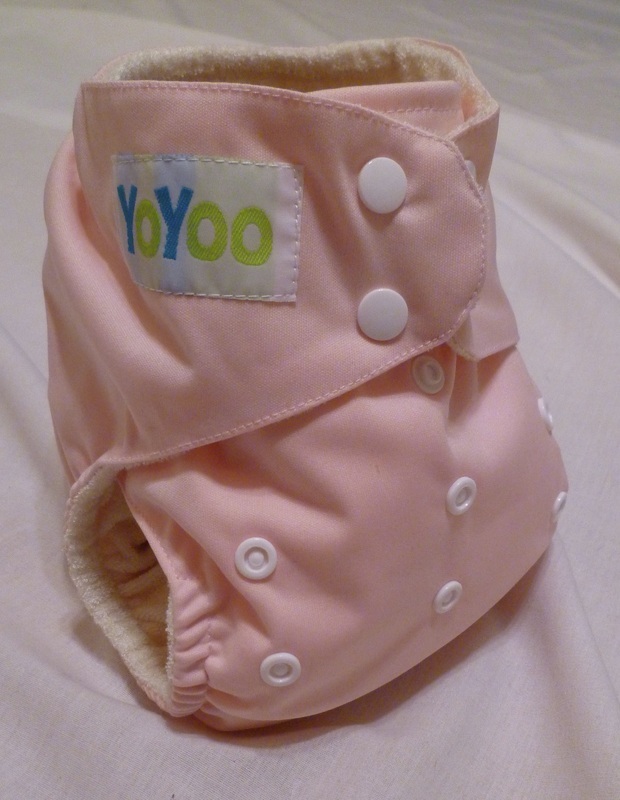 The YoYoo diaper has snaps and is one size – perfect combo for our house. We are on the largest setting for the stride, but not the side snaps that actually secure the diaper. The waist is very roomy, in fact, so roomy, that I am not sure if a thin newborn would fit in this diaper, but I can’t say for sure, since my son is 22 months and 25 pounds. The fit was great! The elastic does not seem to give as much as my BGs or FuzziBunz (FB), however, I did not notice any difference in performance. 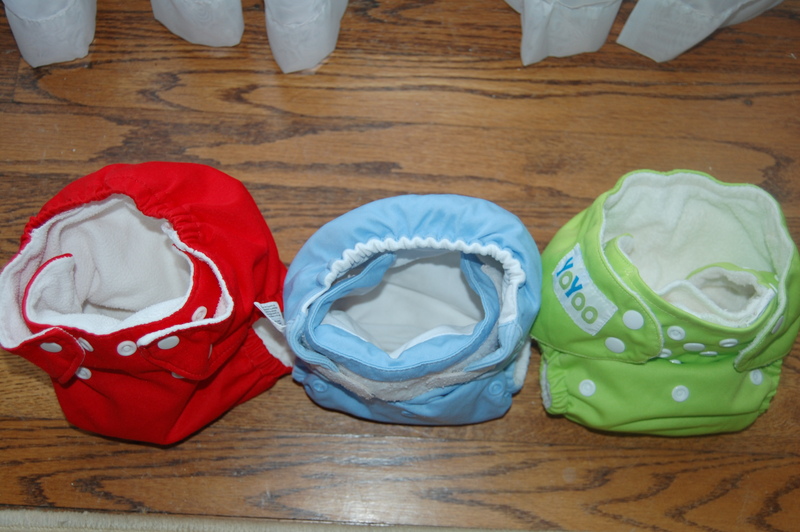 Here are some comparison pictures of the BG one size, the FB medium perfect fit and the YoYoo one size diapers. Bamboo is supposed to be really absorbent, and I will have to say from experience, that I find this to be accurate. We only had one leak and really that was my fault because he needed changing and I was trying to beat the system thinking “Surely we can make it home – it’s only 10 minutes!” Of course, he went and we had a leak, but he was so wet, I’m certain the FB and BGs would have also sprung a leak. It also contained the BMs very well. This is my favorite part of the diaper. The pocket opening is in the front of the diaper, which is awesome because then poo does not get into the pocket and directly onto the insert (which is my biggest beef with my BGs, well, maybe 2nd after the Velcro). The opening is a little small, so it may be a little difficult for someone with large hands to stuff, but this is a feature I like because there is not a bunch of excess fabric that can stick out and cause a leak (which is my least favorite thing about the FB). Another neat thing about the insert is that it snaps into the diaper minimizing any shifting of the insert. I am sure it works fine without snapping it in since unsnapping it could cause a little wetness to get on your hands, but I hold the back and front just so, so I can unsnap without touching the insert or inner lining. Yes, I am a little OCD and I am OK with that. So far, I have not seen any staining on the cover or insert. Both clean very well, and so far no stink either! I rinse even the wet diapers and this has been my best offense against the horrid ammonia smell cloth diapers sometimes get. I wash mine with Rockin Green Soap along with my other diapers. I occasionally use bleach (once a month or less). The YoYoo bamboo diapers are not to be bleached, so I am careful to ensure they skip the bleach load. My system is: cold rinse, long hot wash, 2 rinses. I hang the covers and dry the inserts in the dryer. Overall, I think this is a great diaper and because of the snaps and roomy fit, it’s a favorite even over my BGs (I think we’ve established the fact that I am not a Velcro fan) and FBs right now (medium perfect fits are getting to snug on baby’s chunky legs)! There are several great colors to choose from. As stated, my only concern is not sure how this would fit on a petite baby, or tiny newborn, but since I did not try this on a newborn, I can’t say for sure, just would advise you to order 1-2 diapers to try before ordering a whole stash – something I recommend before ordering a stash of ANY diaper. Want to get 25% off the Snaps & Snails diapers? Go to the Snaps & Snails website, then email sales@snapsandsnails.org with your order – be sure to use amomsblog as the subject line – and receive 25% off your order! Like all good deals, it does end, so snag up this deal before it expires on October 23rd. The fine print: I received these diapers at a discount price in exchange for an honest review. The opinions here are completely my own and was influenced by nothing other than my own experience.